Per pale vert and gules, a boar's head couped close argent crowned with a chaplet of thorn vert, between in fess two claymores inverted argent. Angus Gove Mackinnon joined the SCA in 1988. 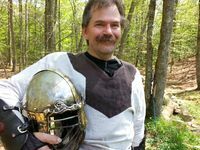 After attending his first event (Pennsic 17), he became an active member of the Riding of Hawkland Moor, in the Barony of Northwoods, of the Middlekingdom. Angus served Hawkland Moor as the groups Knight Marshal from AS 30(?) to As 43. In AS 35 Angus became the Baron of Northwoods. He server with Mistress Ciara McRobbie until As 43 when they moved to the Barony Beyond the Mountain in the East Kingdom. Since moving to the East Kingdom Angus has become the group Knight Marshal for the Barony Beyond the Mountain, and served as baronial heavy weapons champion. Angus was born in Kyleakin a village near the Caisteal Dunakin, on the Isle of Skye, Scotland. Born around 1100 in a coastal village that was inhabited with Norsemen and Celts, Angus was trained in seamanship and warfare. Angus enjoys armored combat, armoring , blacksmithing , brewing mead, leather working , and running an Apiary.